Michael is the founder and Artistic Director of the London Choral Sinfonia. He has worked with the Philharmonia Orchestra, Hamburg Symphony Orchestra, Royal Philharmonic Orchestra, Britten Sinfonia, Academy of Ancient Music, the Orchestra of the Age of Enlightenment, London Mozart Players, Camden Symphony Orchestra, Tonbridge Philharmonic, Woking Symphony Orchestra, Hertfordshire Chamber Orchestra and the London Camerata, alongside conductors including Sir Jeffrey Tate and Stephen Layton. In the autumn of 2017 he took up the post as Conductor and Musical Director of Islington Choral Society. He has been Artistic Director of London Lyric Opera since 2012, Musical Director of the Epworth Choir since 2014, and also currently holds positions with Guildford Choral Society and the University of West London Chamber Choir. Highlights this season include a debut conducting the Philharmonia Orchestra in a programme featuring Chloe Hanslip (violin) and the Mozart Requiem; another debut conducting Polyphony as part of the Swansea Festival; two guest-appearances conducting Tonbridge Philharmonic in concerts of Elgar’s Cello Concerto and Rachmaninoff’s Symphony No.2, followed by a performance of Brahms’ German Requiem; further projects with the Royal Philharmonic Orchestra and City of London Choir; conducting Opera Della Luna’s critically-acclaimed production of Monckton’s The Arcadians at Wilton’s Music Hall; and a recital tour of Italy. Recent and upcoming projects with the London Choral Sinfonia include the St John’s Smith Square Christmas Festival, Britten St Nicolas with Nick Pritchard (tenor), Bach’s Jauchzet Gott with Katherine Watson (soprano) and Crispian Steele-Perkins (trumpet), Mozart Requiem featuring Duncan Rock (bass) and an all-Bach programme featuring Guy Johnson (cello). Recent highlights have also included projects with the City of London Choir and the Royal Philharmonic Orchestra at the Royal Albert Hall, directing the critically-acclaimed production of Verdi’s La Traviata for Go Opera and its subsequent revivals; a Channel 4 film for London Lyric Opera, directing Opera Della Luna’s nationwide tour of Offenbach’s Croquefer and Tulipatan, as well as performances of Offenbach’s Orpheus and the Underworld at The Lowry, Manchester; and performances of Tchaikovsky: Eugene Onegin as part of Ryedale Festival Opera. 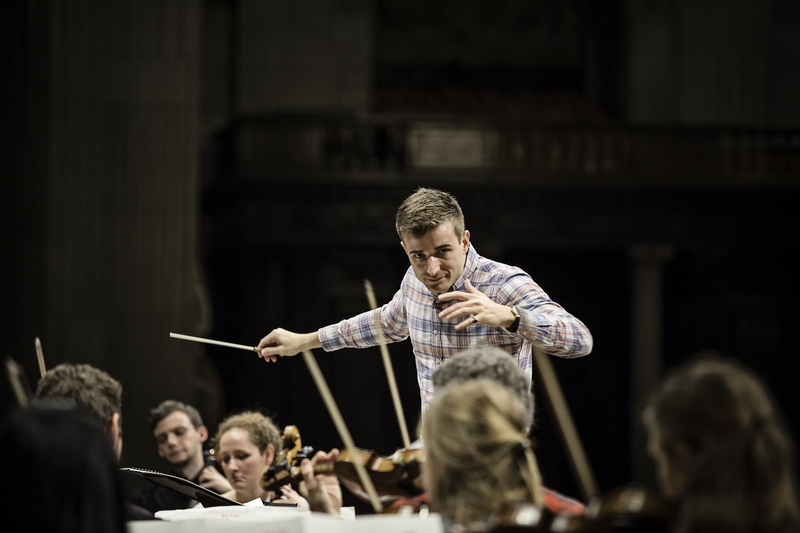 As a guest conductor, recent projects include Chausson’s Symphony Op.20 and Copland: Appalachian Spring with the London Lawyers Orchestra; a concert tour to Belgium with Amici Voices; a concert with the Band of the Royal Marines; Bach Cantatas with the Cambridge Bach Players, and concerts as party of the City of London Festival and Celebrate the City with the London Choral Sinfonia. Michael Waldron’s discography includes numerous Hyperion recordings with the Choir of Trinity College, Cambridge, recordings with the Choir of Worcester Cathedral, a world-premiere recording of music by Ian Assersohn, and two upcoming releases with the London Choral Sinfonia of music by Richard Pantcheff and a disc of contemporary Christmas music. A champion of new music, Michael has premiered new works and recordings with numerous composers including Tarik O’Regan, Francis Grier, Richard Pantcheff, and Oliver Rudland. He will premiere two new works this season by the LCS Composer-in-Residence, Owain Park. He recently premiered a new work by Oliver Rudland with a libretto by the Poet Laureate, Carol Ann Duffy. His realisation of Francis Grier’s epic Sword in the Soul was premiered in 2010 and featured poet Sir Geoffrey Hill and librettist Alice Goodman. Michael continues a busy profile as a pianist and accompanist, having performed extensively across the world. Recent highlights include recitals with Charlie Siem at the Palazzo Ruspoli, Rome; Topi Lehtipuu at the Philharmonie, Luxembourg; with the Orion Orchestra under the direction of Edward Gardner at the Royal Festival Hall, and a studio recording with Pink Floyd at Abbey Road. He has also worked alongside Dame Kiri te Kanawa, Emma Bell, Andrew Foster-Williams, and Gerald Finley. Michael Waldron began his musical training as a chorister at St Ambrose College. After a gap year as Organ Scholar at Worcester Cathedral, he spent four years as Organ Scholar at Trinity College, Cambridge, under the direction of Stephen Layton. During his time there, Michael was involved with the Choir’s numerous international tours, concerts, broadcasts and Gramophone award-winning recordings. In 2007 Michael was winner of the Cambridge University Edith Leigh piano competition.